The ICRC works on improving access and quality of services available to people with disabilities, by providing technical and material support to centres nationwide run by the National Authority of Prosthetics and Orthotics (NAPO), as well as to the Khartoum Cheshire Home, a children's rehabilitation programme in Khartoum. In Khartoum Cheshire Home, the ICRC provides training and materials to the clubfoot program, which rehabilitates babies born with clubfoot, enabling them to walk and lead a mobile life. Abubakr is the first child of a young Sudanese couple living in Khartoum City. He arrived at the Khartoum Cheshire Home (KCH) Clubfoot Service when he was 3 days old. Both mother and father are young (26,35), the mother has a family history of Clubfoot (brother). They are also both very supportive to the childs recovery and to the clinical team. Abubakr scored 6 for both feet in Pirani scoring in his first visit. Pirani scoring is a tool that allows determine severity and monitor progress of clubfoot. It is divided into six clinical signs that are scored independently, 6 is the maximum degree of severity. 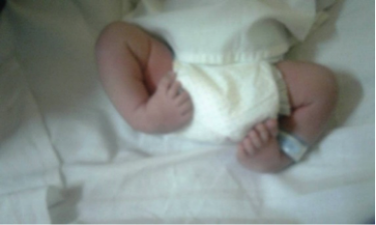 The family was informed about the child having Clubfoot one hour after delivery at the hospital (Saint Marie). The parents look themselves for places of treatment and through the internet they came to know about the Khartoum Cheshire Home and the Clubfoot Clinic. Abubakr was casted 9 times with a progression showed in the following graph. A professional in the clinic carried out Pirani scoring in both feet in every visit; starting on the first visit continuing after removal of plaster in each session. The left foot had a classical progression and was ready for FAB after the 7th cast (see score 8) but the right foot was not there yet, therefore we applied 2 more casts to see the right foot coming to a more corrected stage before progressing to the next stage. Image 1 and 2. 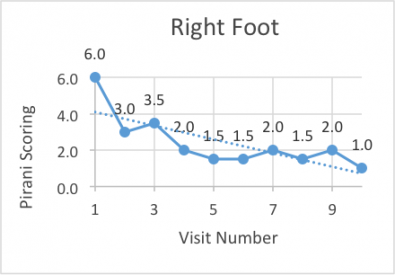 Evolution of Pirani scoring in 10 visits for right and left foot. 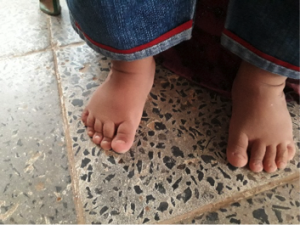 After the casts Abubakr did not need a tenotomy; he scored 0 for Equinus in both feet, although the Posterior Crease and the Empty Heel were still there at 0,5 on the Right Foot. Bracing Phase was then started with Food Abduction Braces (FAB) prescribed to use during 23 hours during 3 months. Afterwards he continued to use the FAB at night. Family come for regular checkups every 3 months. During the Bracing Phase Pirani scoring is also conducted in every visit. Nowadays Abubakr is 12 months old and he has a very satisfactory gait (no varus of the heel on the posterior view or supination on the frontal view), he has been scoring 0 in both feet for the last 4 visits and he runs around the clinic merrily and fast. He is using the FAB every night and coming regularly for checkups. The mother has also become a volunteer in the Clubfoot Program and she has been facilitating Mothers Groups in order to explain to other families the stages of the treatment protocol, share her experience with other families and answer questions they might have. During the sessions little Abubakr runs around room and plays around which it is also very encouraging for the new families. Note for Curious Pirani Learners: Also to mention that 2 different persons scored the Pirani which explains the oscillation of the scores for the right foot from 2 to 1,5. Reviewing the files, that was detected, as scoring 7 and 9 was done by Professional A and scoring 5,6 and 8 by Professional B. It was always the same component of disagreement Empty Heel), due to the detection of this lack of alignment with the procedure, a refresher training was organized in order to make sure we are all scoring with the same criteria. 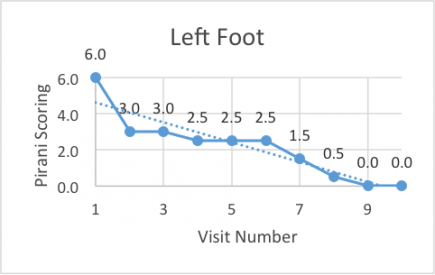 Nevertheless, there is the possibility that the heel was in between scores and in our clinic we accept a discrepancy of 0,5 in between raters for some cases.